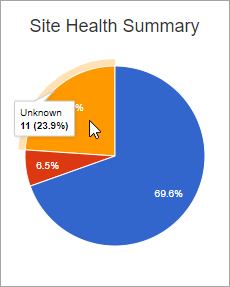 Summary page displays a brief or a gist of the security of the existing website as per the scans performed and vulnerabilities found. Vulnerabilities found with a specific scan type is displayed on the top. 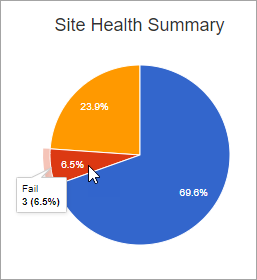 Site Health Summary pie chart displays the specifying percentages for Pass, Fail and Unknown scan status. Group and Sites option displays the available data with all the scan details. Upward or Downward arrows specify the vulnerability Increase or Decrease from the past scan respectively. 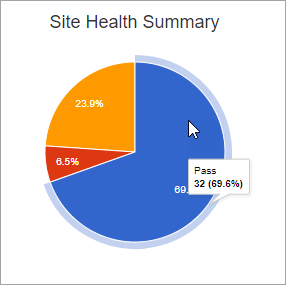 A website's health summary is classified into 3 parts, each specified with a colour i.e., Pass(blue), Fail(red), and Unknown(Yellow) with percentages. Cursor over a specific colour of the graph to find out the details like Health Status(pass, fail etc.,) and Vulnerability Count. 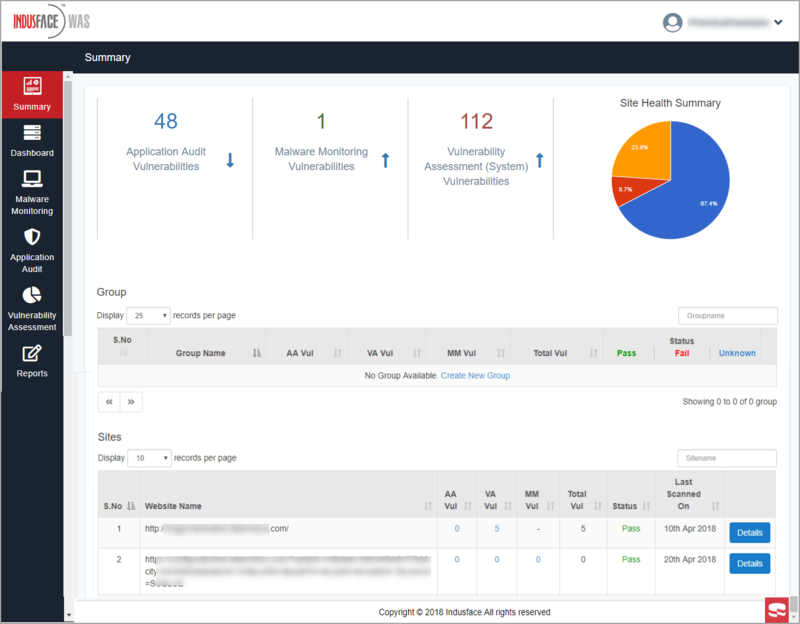 A scan is shown as pass if there is no Critical or High vulnerabilities found in the latest scan for all the 3 scan services that is Application Audit, Malware Monitoring, and Vulnerability Assessment. A security scan is termed as Fail for any one of the scan services if it has some Critical or High vulnerabilities which needs an immediate attention. Site Status is marked as Unknown if a user is not subscribed to all 3 services or if scan is not complete for all 3 services. This option displays the existing groups and it's details like subscribed Scan Services, Total Vulnerability Count, Scan Status etc. Click Groups option to select multiple groups, all the websites associated with the groups is displayed in Sites option. When multiple groups are selected, the unique websites of all the selected groups are displayed in Sites column. 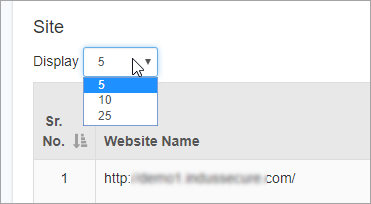 Click Display drop-down and click any one of the displayed number. The allows the selected number of records to be displayed. Click Details button to view complete of website security status. Dashboard page with the Group details appear. The selected group is displayed in Web Application drop-downs. The detailed information of a selected group like threats found by recent scans, top threats found etc., are displayed in the graphical format. Click Excel Sheet icon to download the report in CSV format. 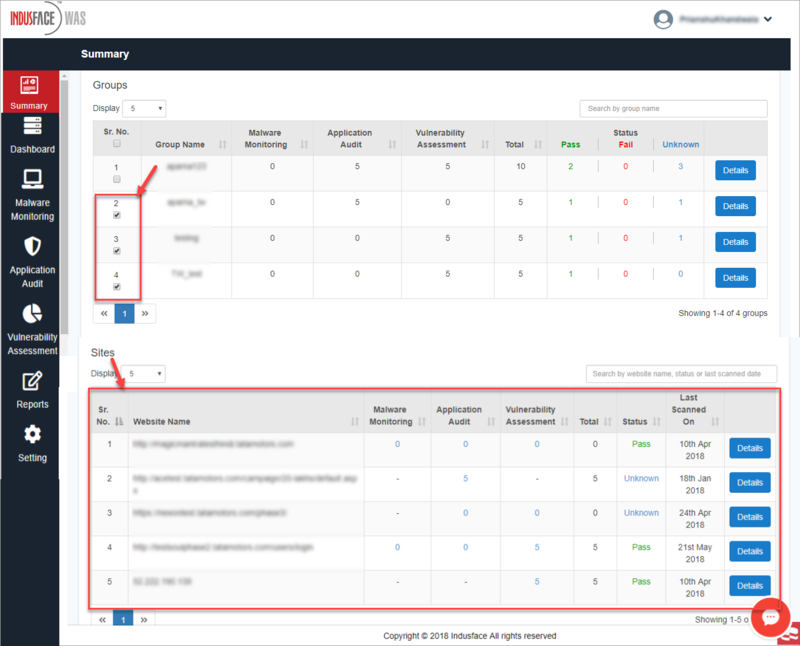 This option displays the summary of the existing websites of a specific user. Some of the details are no. of vulnerabilities found in all the 3 scans, Scan Status, Last Scan. Hyphen is displayed if scan type is unsubscribed in Sites column. Zero indicates no vulnerabilities found. Lock icon is displayed for the scans with no permission to view the details. Cursor over the icon to view the same message. 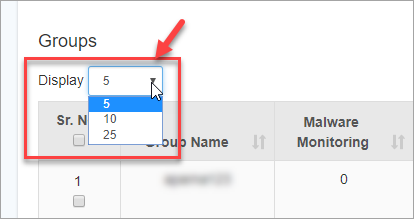 Click Display drop-down and click any one of the displayed number. This allows the selected number of records to be displayed. Click Search box on the right and enter Website Name, Status or Latest Scanned Date to view the information. Click Details button to view the further information. Dashboard page of the selected site appears. The Web Applications drop-down displays the selected website. The latest scans performed, threats found for the subscribed scans and different statistics are displayed.